Me, Isidra, talking about gadgets! Susan on Cut it out! In less than a year, the family grapples with the loss of another Aunt. There are 3 out of 15 left. We have a huge Virginia-based Person family because my grandfather Romnie Person had been married twice and had 9 kids before he met my grandmother Ida (4 of his previous children–a set of twin and two children due to a flu epidemic had already passed away.) A legendary woman herself, grandma went on to have 11 more, with one being still born. But those who survived helped form a legendary family: Stella, Walter, Archie, Warner, Nathan, Andrew, Rose, Thomas, Emma, Connie, Audrey, Mildred, Ida, Alvin and Jerry–15 altogether. My grandfather taught us many things hands on: he drove us over to North Carolina to see the Native American relatives some Sundays, and –get this–built a viable construction business which hired his sons and sent all of his children — who wanted to go — to college. He invested in land, built houses and countless buildings and built the school so his children would not continue to trudge past the white school in the freezing snow to get to their own. AND he built the family church. Our aunts and uncles enveloped us in love, and were beautiful, fun and loving. When my father moved to New Jersey, Aunt Emma would spend her college summers helping him and my mom take care of my sister Bunny and me. I remember her lap, her warm embrace, her guiding hands and her gentle soul. She was a beautiful, thin slip of a girl with long hair. She loved the piano and played ours often. Mom, who became great friends with her said she just picked it up and had a special gift. She had the patience of Job, and taught my Mom to drive after my Father’s impatience frustrated my Mom no end. Mom said she was an excellent teacher and when Mom passed she drove to work the next day and has been driving ever since. Emma met a young service man named Amos “Mack” Harrison in Emporia at her job at a drug store, but it wasn’t until their paths crossed again in NJ and they held an all night discussion at White Castle, that they fell in love. Not long afterward they married in our living room in Linden, NJ, then moved to New York, not far from Shea Stadium where the Mets played. He and my daddy were at once known as “Amos and Andy” because, well those were their names, and the Mutt and Jeff looking pair pal’d around quite a bit. Aunt Emma taught us how family is done. Although she had her own three cute kids–Rhonda, Debbie and later Mark, she always opened her home to us. I can honestly say I never remember a cross word from her toward anybody. When I became a teen I found my way to Aunt Emma’s on the subway from NJ and hung with Rhonda and Debbie and their cousin Cookie many weekends, some at block parties dancing in the streets. She loved her cats, especially Mortimer and Tiger, and furry four legged friends in general, it seemed. But she loved people too. On my birthday last year she called me out of the blue and made my day. She said “Of course, I remember your birthday!” she said cheerily, all those years later. Aunt Emma moved to Virginia after our grandmother (her mother) passed and looked so similar to my grandmother standing in that same kitchen which turns out so many legendary delights, especially her mouth watering collard greens. There she took care of our Uncle Mack whose health issues had confined him to a wheel chair for decades. After he passed, she committed herself to working with senior citizens. She had been playing piano for the church since her return to the VA across from my Uncle Thomas on the organ. She loved raising her grandson Jose who was the light of her life. Tall like uncle Mack, he played basketball, but went to North Carolina A &T as an engineering major. He currently works in the U.S. Patent Office. Then along came Mark’s kids to raise, Markeen and Najee, also handsome young men who I can only imagine what must be going through their minds right now. Aunt Emma was their rock, and they are not yet fully grown, so who will step into Aunt Emma’s petite but large shoes? 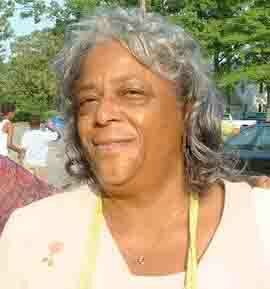 Her very life was serving God, and her church, raising her grand children, being there for her family. Oh, and those cats!!! And, personally, she reached out to our son Jaaye during his Hampton and Howard years on the East Coast, so much so, that when he learned she passed, he sprang into action and thankfully arranged the flight back East and the rental car for us both. Her sisters Rose and Ida, and brothers Thomas and Alvin were always there for her, but in the last few years, all but Alvin and Ida succumbed and she missed her departed siblings dearly. Well, now, Aunt Emma has joined them but, I still think she is gone too soon. After all, I had just seen Aunt Emma Thanksgiving and she looked fine. She told me and many of us that she wasn’t comfortable taking over the role of family matriarch. Who knew a cancer storm was raging within? It continues to blow our family and our people away and now has claimed another, seemingly out of the blue. Her children stood by her until the end. Rhonda, has a government career, Debbie, is a natural organizer and Mark just started a new position in New York. Life will be different without the rock of their mother there to go to daily but they will as so many others have done. She gave them everything they need. Just a few weeks ago, I was enjoying the Essence Music Festival in New Orleans with my cousins Stephanie and Sharon and Steph’s daughter Michal. We were enjoying a seafood restaurant overlooking the Mississippi when I pressed them to take a break and call Aunt Emma. We did, passing the phone around the table. When I heard her weakened voice, out of the blue, my tears flowed and just kept coming. I thought I was being silly because she could have gotten better. But they told me that she had been diagnosed with liver cancer, and I do not know anyone who has won that battle yet. The last time I talked to Aunt Emma was when my sister and I called. Home from the hospital, back in Emporia, she weakly said “It seems I’ve got a bigger challenge to contend with than I thought.” I didn’t allow her to entertain the insurmountable thought but, I regret that. She had something to say which I dismissed like it was a cold she’d get over. I knew it was liver cancer, but I was hoping against hope, ya know? Her daughters kept up the good fight and fed her fresh juice regimens, healing teas and the like. They too held out hope. But there was nothing anyone could do to change God’s mind from calling her home. Truly an angel, her work here is done. It is hard to grapple with, but grapple we must. Now, we only have Aunt Ida, Uncle Alvin and Aunt Audrey. It is now left to my generation to step up and help them. We are also the Aunts and the Uncles. We must help guide this next generation for that is the way Aunt Emma showed us. Now that the beautiful service is over and she is in her final resting place we cousins (and there are many), must all lead by her example. If anyone has helped your life over some rough edges, you (all-us-we) must now pay it forward, because this next generation cannot wait.